Borchert Field: This Week in 1913: "They're Off!" 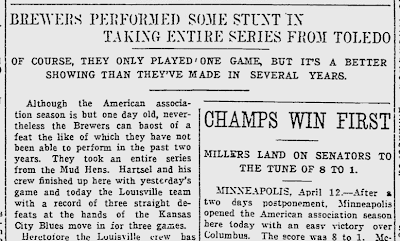 Editor's Note: This is the third in a series of posts chronicling the Brewers' first pennant-winning season. 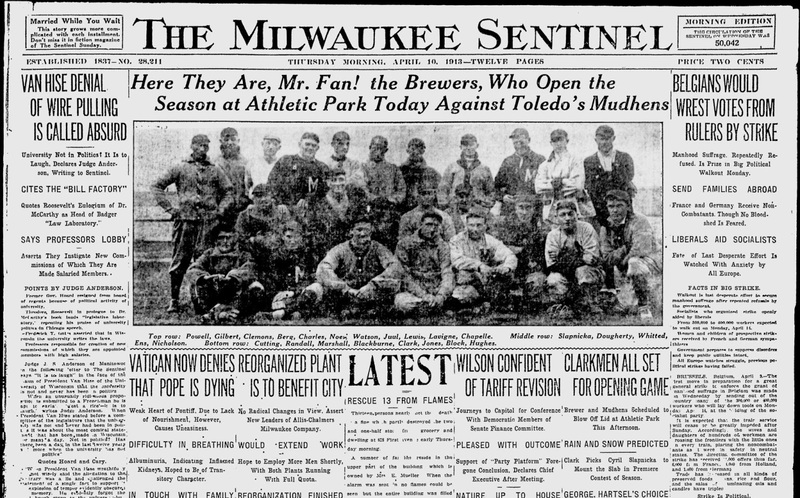 The Brewers arrived home in Milwaukee from their Spring Training adventure on April 8th, "after having to almost swim their way out of Owensboro," according to Brownie. Manager "Pep" Clark announced that the starter for Opening Day, two days away, would be the Austrian-born Joe Hovlik. 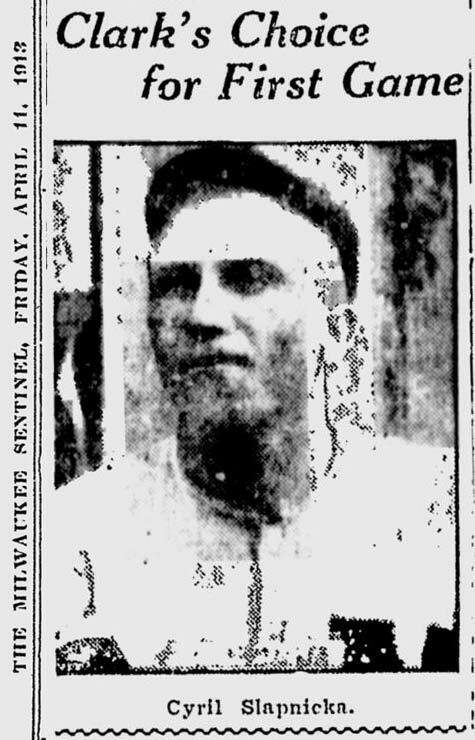 The right-handed hurler had played a pair of seasons for the Senators and one with the White Sox before being shipped to Milwaukee in 1912. In the days before artificial lighting in stadiums, he was known as a particularly effective "dark" pitcher, his ball harder to hit as the sun started to go down. On the same day that the Brewers returned home, the Mollys packed up and shipped out to Oconomowoc for their Spring Training. They took a couple of the bigger club's players with them, as the Brews transferred first baseman Mutz Ens (who had come to Milwaukee from the Chicago White Sox as part of the deal for Ray Schalk) and pitcher Bill Powell to the junior club for seasoning. Also on that day, the Brewers had their first public practice in Milwaukee. A "big bunch" of fans came out to the wooden ballpark to get the inside dope. The Milwaukee Journal reported that "the Brewers displayed more pepper in their first workout on the home lot... than they showed at any time last season." New skipper Harry "Pep" Clark was spreading around a little of the nickname he had earned over the nine previous seasons at Athletic Park's third base. Expectations were high, expectations that could only be dampened by Wisconsin's infamous April weather. A mixture of snow and rain were forecast to fall on Milwaukee on Opening Day (a situation Cream City baseball fans are all-too-familiar with). Still, the fans were ready to go, and so were the teams. A parade was scheduled ("for the first time in years") to kick off the season. 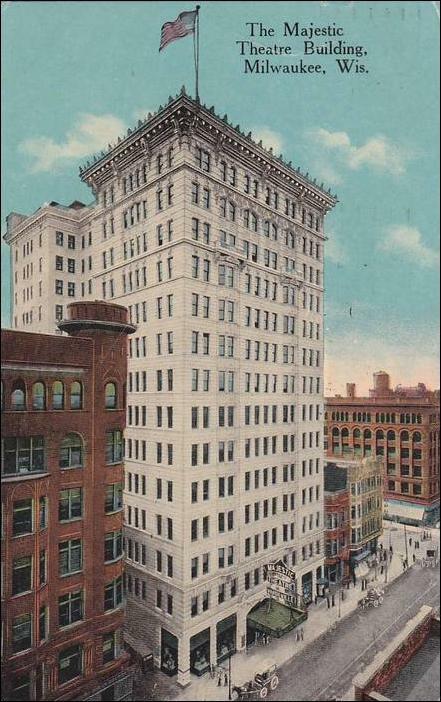 Starting at the Plankington Hotel downtown, the two teams would make their way to Milwaukee Street, then to East Water, East Water to Oneida, Oneida to West Water, to State Street, to Seventh, to Grand, to Third, to Chambers, and taking Chambers all the way to the ballpark. A concert would then entertain the fans in the stands while the two teams warmed up on the field. Splashed across the top of the April 10, 1913 Milwaukee Sentinel was a panoramic picture of Clark's men. Top row: Powell, Gilbert, Clemons, Berg, Charles, Noel, Watson, Juul, Lewis, Lavigne, Chapelle. Middle Row: Slapnicka, Dougherty, whitted, Ens, Nicholson. Bottom row: Cutting, Randall, Marshall, Blackburne, Clark, Jones, Block, Hughes. In addition, the Milwaukee Journal noted that Brewer business manager Bill Armour had inaugurated a new tradition; a flag would be flown over the Majestic Building on Wisconsin Avenue - "a white flag with a blue ball in the center" - whenever the Brewers were playing a game that day. No flag on scheduled game days meant postponement. There was "some question" as to whether the flag system would be ready for the Opener, but it was expected to be in place by the second game. The Brewers were ready, the fans were ready, but the weatherman wasn't. 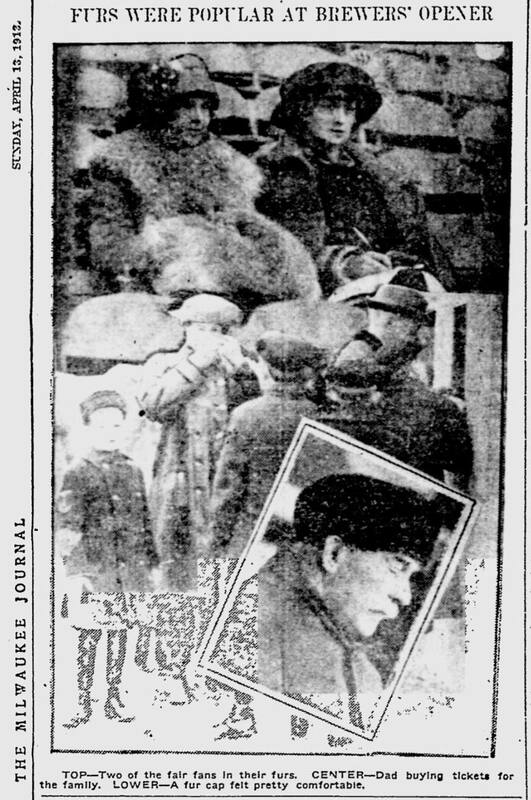 April 10, 1913 was a soggy, dreary day in Milwaukee. 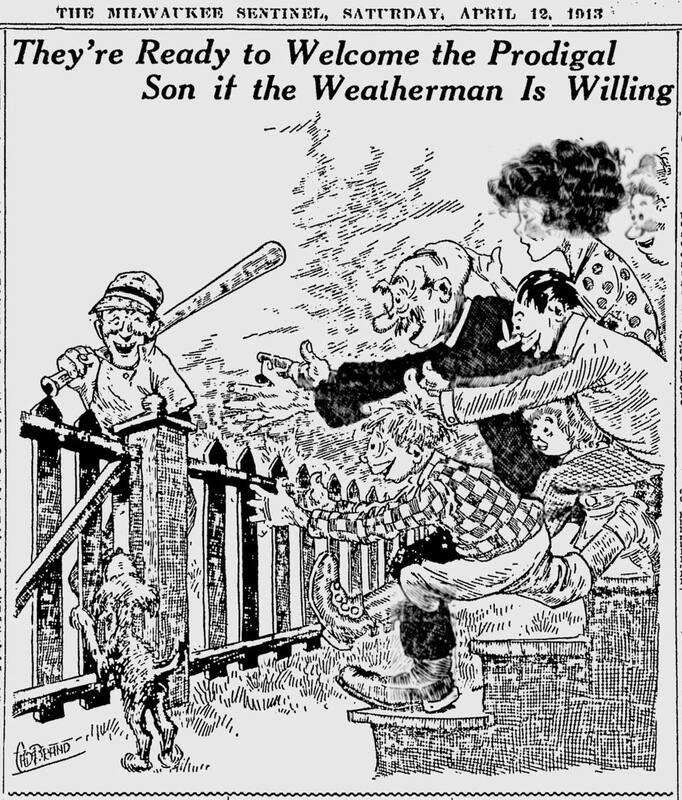 Conditions were generally poor all across the American Association, as a combination of snow and rain postponed all but a single game (Kansas City at Louisville, the visitors taking a comfortable lead in the standings with a 1.000 record). The parade was called off, the game was called off, and Milwaukeeans had to wait at least a day to see their new Brewer club. Brewer officials announced that they would try to hold the season opener the next day, April 11. That next day wasn't any better. Rain continued to pound the Cream City, and the second game of the season was called off in the morning, before the fans got anywhere near the old wooden ballpark. Faced with a second delay, manager Clark announced that his Opening Day starter would now be spitballer and vaudevillian Cyril Slapnicka. Hovlik would be next in line if Clark felt Cy wasn't ready to take the rubber, or if the game was delayed due to weather and Pep could count on Hovlik's "darkness" skills. If everyone had been eager for baseball on April 10th, by the morning of the 12th they were downright desperate. 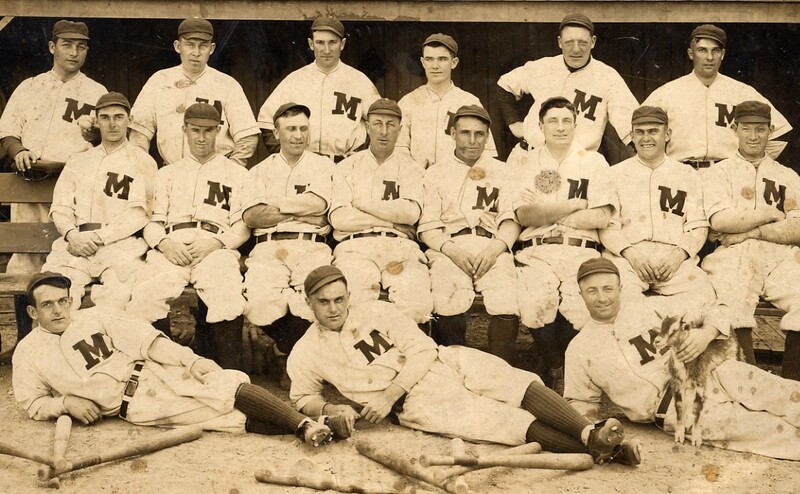 The Mudhens were particularly keen to get a game in, as they had to leave Milwaukee that evening on a train for Kansas City and their second series of the season. 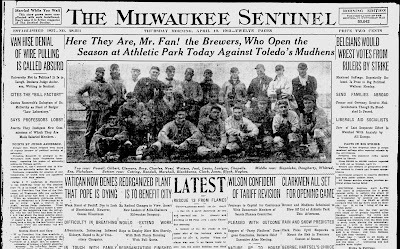 Fortunately, the Athletic Park grounds were drying nicely, the rain was holding off, and at noon the Brewers announced that there would finally be a game. Armour could run his white-and-blue banner up the Majestic Building's flagpole for all Milwaukee to see. The rain had stopped, but the air was frigid, the temperature right around freezing, as the teams took the field. 2,500 die-hards turned out, many dressed in their finest fur coats and covered in steamer blankets, and others lined the streets to peek trough knotholes. Inside or outside the park, those brave souls were rewarded with a crackerjack game. Although the Mudhens put up a good fight, they lacked the Brewers' "pep" and were unable to plate a single run. The Brews, on the other hand, were able to score two runs in the bottom of the first. 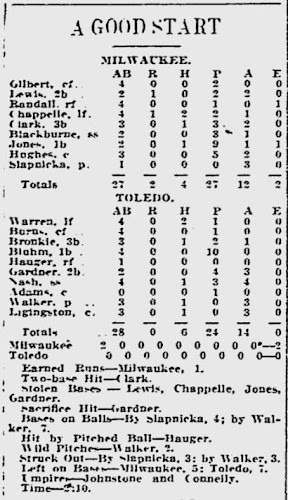 Clark came up to bat with men on the corners (outfielder Larry Chappell at first and second baseman Phil Lewis on third), and he flashed them the sign for a double steal. 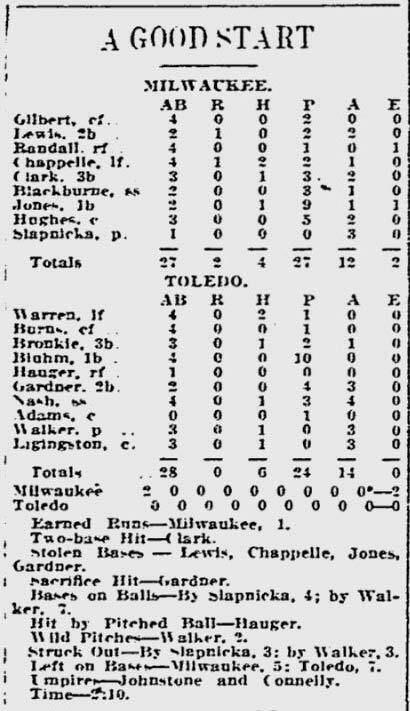 The Toledo catcher bit, and when he threw to second in a vain attempt to nab Chappell, Lewis was able to scramble home. Clark then lined a double off the right field wall to score Chappell and give the Brews the only runs they would need. 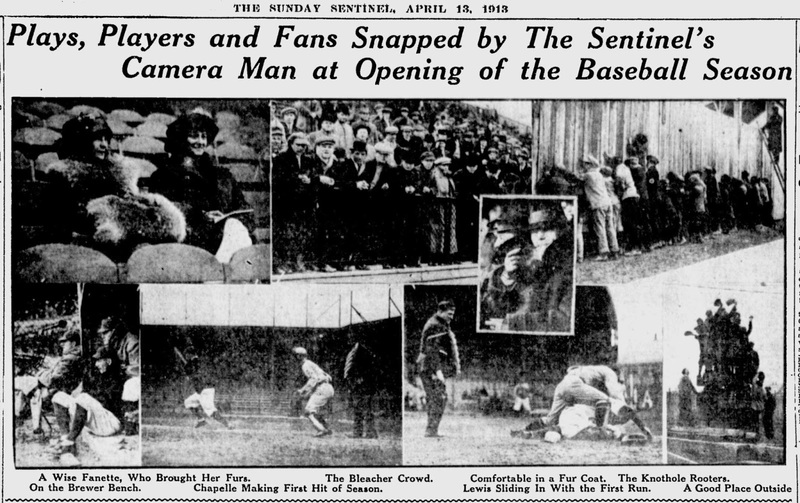 The Sentinel's cameras captured the action on and off the field (especially the same pair of fur-wrapped ladies that so attracted the Journal's attention). 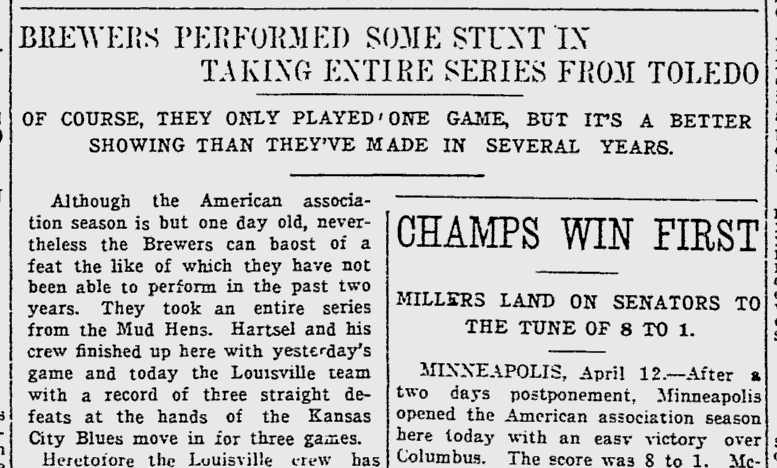 The Brewers' 1913 season was off to a very stylish start.